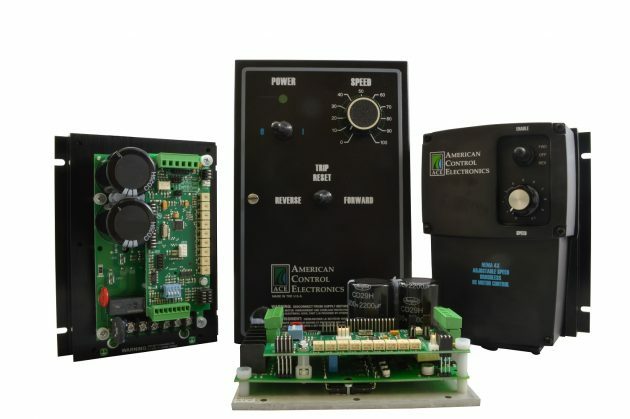 American Control Electronics (ACE) has introduced the PML Series, a new family of versatile, feature-rich, configurable controls for brushless DC motors. PML drives can control motors that range from 90 to 280 VDC, up to 5 amps/1.5 HP, using either 115 VAC or 230 VAC line sources. On-board trim pots allow operators to quickly set maximum and minimum speeds, acceleration and deceleration rates, motoring and regening current limits, as well as the proportional and integral feedback gains. An onboard microprocessor allows for custom programming the PML Series for tasks as simple as changing the purpose of a jumper or trim pot, or as complex as programming an entire application-specific routine. The PML also seamlessly integrates PLC-like functionality into operations, allowing users to eliminate the need for a separate PLC altogether or enhance a system that currently doesn’t have one. These controls are positioning-application capable, with feedback sampling rates of 16Khz. Each drive is designed for feedback from 120° hall effect sensors and can be commanded with a wide range of analog inputs with ACE’s built-in isolation.